Solvent printing is the perfect solution for signs, vehicle wraps, and many other print applications. Solvent inks produce top-quality graphics, enabling printing service providers (PSPs) to maintain high-volume output and lower production costs while providing their customers superior color gamut and accuracy. Although solvent inks provide great performance and have many additional benefits, they come with one frustrating workflow drawback: the delays PSPs experience by having to wait for solvent ink to dry, particularly when the application requires lamination. A new breakthrough solvent ink technology solves this problem by reducing print curing time by at least 75% of the 24 hour waiting period normally recognized by media manufacturers and industry specialists. 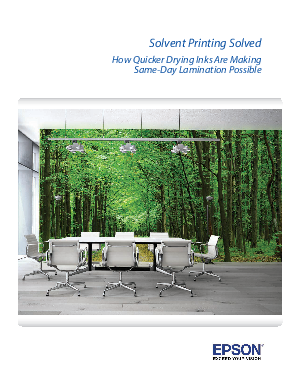 These new solvent inks make it possible for PSPs to laminate solvent prints on the same day they are printed. PSPs can achieve high image quality without sacrificing valuable time, plus they can avoid clutter and reduce space requirements needed for off-gassing prints. This new ink technology provides PSPs a competitive edge, giving them the ability to produce solvent prints while meeting customers’ demands for high quality and quick turnarounds.